While weather disasters have always plagued humanity, there has been a clear recent uptick in such events. Naturally, the greater scope of these disasters is due partially to the human population being larger than ever and occupying more land—especially in areas prone to such events. That said, events such as the floods in Louisiana and the steady inundation of the sea in many places (such as Miami) are indications of a real change. Nearly every climate scientist accepts that climate change is occurring and that human activity has had an influence. Given the historic record, it would be irrational to deny that the climate changes and few claim that it does not. The battle, then, is over the cause of climate change. Unfortunately for addressing the impact of climate change, it was brilliantly changed from a scientific issue into a political one. Making it into a partisan issue had the usual impact on group psychology: it became a matter of political identity, with people developing a profound emotional commitment to climate change denial. When denying climate change became a matter of group identity, it became almost impossible for reason to change minds—in the face of overwhelming evidence, people merely double down, deny the evidence, and craft narratives about how scientists are biased and environmentalists hate corporations and jobs. To be fair, some of those who accept climate change do so out of political identity as well—they are not moved by the science, but by their group identity. They just happen to be right, albeit for the wrong reasons. Not being an expert on climate change, I follow the rational approach to any issue that requires expertise to settle: I go with the majority view of the qualified experts. As such, I accept that climate change is real and humans play a role. If the majority shifted, I would accept that view—after all, the history of science includes numerous shifts. As a philosopher, I do believe in reason. However, I am also a practical person and know that reason is the weakest form of persuasion. Because of the entrenchment over climate change, trying to use reason and evidence to change minds would be a fool’s errand. As such, I suggest a purely pragmatic solution: stop using the C words (“climate change”) when trying to influence public policy, at least in cases in which there is strong ideological resistance. Using those words will simply evoke an emotional response and create strong resistance to whatever might be proposed, however reasonable. As an alternative, the approach should be to focus on the specific threats and these should be cast in terms of risks to the economy and, perhaps, the lives and well-being of voters and consumers. There should be no mention of man-made climate change and no proposals to change behavior to counter man-made climate change. In short, the proposals must focus solely on mitigating the damage of weather events, with due care taken to present the notion that these events “just happen” and are “natural” with no connection to human activity. It might be objected that this would be analogous to trying to combat the Zika virus by dealing only with the effects while refusing to say “virus” and not proposing any efforts to address the cause. This is certainly a reasonable point. However, if there was a powerful political movement that refused to accept the existence of viruses and citizens emotionally devoted to virus denial, then trying to persuade them to deal with the virus would be a nigh-impossible task. If they did accept the existence of the effects, then they could be enlisted to assist in addressing them. While this approach would hardly be optimal, it would be better to have their cooperation in mitigating the consequences rather than facing their opposition. It might also be objected that I am deluded by my own ideological views and have been misled by the conspiracy of scientists and liberals who are in the pocket of Big Environment. Since I rather enjoy a good conspiracy theory, I certainly admit that it could be the case that the noble fossil fuel companies and those they pay are right about climate change and the scientists are either villains or dupes. If so, then not talking about climate change would be the correct approach—just as not talking about climate demons is the correct approach (because there are no such things). Since the weather events are really occurring, then addressing them would still be reasonable. So, regardless of whether climate change is real or not, my approach seems to be a sound one: avoid the resistance of climate change deniers by not using the C words; but enlist them into addressing those perfectly natural severe weather events that will be occurring with increasing regularity. While science and philosophy are supposed to be about determining the nature of reality, politics is often aimed at creating perceptions that are alleged to be reality. This is why it is generally wiser to accept claims supported by science and reason over claims “supported” by ideology and interest. The matter of climate change is a matter of both science (since the climate is an objective feature of reality) and politics (since perception of reality can be shaped by rhetoric and ideology). Ideally, the facts of climate change would be left to science and sorting out how to address it via policy would fall, in part, to the politicians. Unfortunately, politicians and other non-scientists have taken it on themselves to make claims about the science, usually in the form of unsupported talking points. On the conservative side, there has been a general shifting in the talking points. Originally, there was one main talking point: there is no climate change and the scientists are wrong. This point was often supported by alleging that the scientists were motivated by ideology to lie about the climate. In contrast, those whose profits could be impacted if climate change was real were taken as objective sources. In the face of mounting evidence and shifting public opinion, this talking point became the claim that while climate change is occurring, it is not caused by humans. This then shifted to the claim that climate change is caused by humans, but there is nothing we can (or should) do now. In response to the latest study, certain Republicans have embraced three talking points. These points do seem to concede that climate change is occurring and that humans are responsible. These points do have a foundation that can be regarded as rational and each will be considered in turn. One talking point is that the scientists are exaggerating the impact of climate change and that it will not be as bad as they claim. This does rest on a reasonable concern about any prediction: how accurate is the prediction? In the case of a scientific prediction based on data and models, the reasonable inquiry would focus on the accuracy of the data and how well the models serve as models of the actual world. To use an analogy, the reliability of predictions about the impact of a crash on a vehicle based on a computer model would hinge on the accuracy of the data and the model and both could be reasonable points of inquiry. Since the climate scientists have the data and models used to make the predications, to properly dispute the predictions would require showing problems with either the data or the models (or both). Simply saying they are wrong would not suffice—what is needed is clear evidence that the data or models (or both) are defective in ways that would show the predictions are excessive in terms of the predicted impact. One indirect way to do this would be to find clear evidence that the scientists are intentionally exaggerating. However, if the scientists are exaggerating, then this would be provable by examining the data and plugging it into an accurate model. That is, the scientific method should be able to be employed to show the scientists are wrong. In some cases people attempt to argue that the scientists are exaggerating because of some nefarious motivation—a liberal agenda, a hatred of oil companies, a desire for fame or some other wickedness. However, even if it could be shown that the scientists have a nefarious motivation, it does not follow that the predictions are wrong. After all, to dismiss a claim because of an alleged defect in the person making the claim is a fallacy. Being suspicious because of a possible nefarious motive can be reasonable, though. So, for example, the fact that the fossil fuel companies have a great deal at stake here does not prove that their claims about climate change are wrong. But the fact that they have considerable incentive to deny certain claims does provide grounds for suspicion regarding their objectivity (and hence credibility). Naturally, if one is willing to suspect that there is a global conspiracy of scientists, then one should surely be willing to consider that fossil fuel companies and their fellows might be influenced by their financial interests. One could, of course, hold that the scientists are exaggerating for noble reasons—that is, they are claiming it is worse than it will be in order to get people to take action. To use an analogy, parents sometimes exaggerate the possible harms of something to try to persuade their children not to try it. While this is nicer than ascribing nefarious motives to scientists, it is still not evidence against their claims. Also, even if the scientists are exaggerating, there is still the question about how bad things really would be—they might still be quite bad. Naturally, if an objective and properly conducted study can be presented that shows the predictions are in error, then that is the study that I would accept. However, I am still waiting for such a study. The second talking point is that the laws being proposed will not solve the problems. Interestingly, this certainly seems to concede that climate change will cause problems. This point does have a reasonable foundation in that it would be unreasonable to pass laws aimed at climate change that are ineffective in addressing the problems. While crafting the laws is a matter of politics, sorting out whether such proposals would be effective does seem to fall in the domain of science. For example, if a law proposes to cut carbon emissions, there is a legitimate question as to whether or not that would have a meaningful impact on the problem of climate change. Showing this would require having data, models and so on—merely saying that the laws will not work is obviously not enough. Now, if the laws will not work, then the people who confidently make that claim should be equally confident in providing evidence for their claim. It seems reasonable to expect that such evidence be provided and that it be suitable in nature (that is, based in properly gathered data, examined by impartial scientists and so on). The third talking point is that the proposals to address climate change will wreck the American economy. As with the other points, this does have a rational basis—after all, it is sensible to consider the impact on the economy. One way to approach this is on utilitarian grounds: that we can accept X environmental harms (such as coastal flooding) in return for Y (jobs and profits generated by fossil fuels). Assuming that one is a utilitarian of the proper sort and that one accepts this value calculation, then one can accept that enduring such harms could be worth the advantages. However, it is well worth noting that as usual, the costs will seem to fall heavily on those who are not profiting. For example, the flooding of Miami and New York will not have a huge impact on fossil fuel company profits (although they will lose some customers). Making the decisions about this should involve openly considering the nature of the costs and benefits as well as who will be hurt and who will benefit. Vague claims about damaging the economy do not allow us to make a proper moral and practical assessment of whether the approach will be correct or not. It might turn out that staying the course is the better option—but this needs to be determined with an open and honest assessment. However, there is a long history of this not occurring—so I am not optimistic about this occurring. It is also worth considering that addressing climate change could be good for the economy. After all, preparing coastal towns and cities for the (allegedly) rising waters could be a huge and profitable industry creating many jobs. Developing alternative energy sources could also be profitable as could developing new crops able to handle the new conditions. There could be a whole new economy created, perhaps one that might rival more traditional economic sectors and newer ones, such as the internet economy. If companies with well-funded armies of lobbyists got into the climate change countering business, I suspect that a different tune would be playing. Is climate change going to be as bad as it is claimed? What laws (if any) could effectively and properly address climate change? What would be the cost of addressing climate change and who would bear the cost? While I am not a philosophical skeptic (I do believe that knowledge is possible), I am a practical skeptic (I require proof before I believe). While some folks are skeptical of climate change, the evidence seems adequate to support the claim that humans have had a measurable impact on the climate. Given the scale of human activity, this seems inherently plausible. The climate data and causal explanations also seem fairly compelling. Naturally, there are skeptics regarding climate change. Some of these folks are rational skeptics. That is, their doubts are founded on legitimate concerns about the methodologies used in climate science as well as the data in question. This sort of doubt and skepticism is actually a rather important part of the scientific approach: just as Socrates argued for the importance of the gadfly in the context of society, there should also be gadflies in science. Scientists are, after all, only human and are subject to all the same cognitive biases and frailties as everyone else (plus are especially vulnerable to certain biases). Some folks are, however, irrational skeptics. They base their doubt not on legitimate critiques of the methodology or the data. Some of these folks base their doubt not on logic, but on their emotions. They feel hostility towards the idea of climate change and the people who claim it is real. They feel positive towards the folks who deny it. However, feeling is not a good guide to the truth. John Locke argued quite effectively for this in his essay regarding enthusiasm. However, you can test this yourself: try taking a chemistry test or solving a complex engineering problem solely by how you feel about the matter. Let me know how well that works out. To be fair, there are folks who believe in climate change based on how they feel. While I am inclined to say that their belief is correct, I am even more inclined to say that they are not warranted to hold said belief since it is based on feeling rather than on actual reasons. Some of the skeptics base their doubt on the fact that the truth of climate change would be contrary to their interests. In some cases, they are not consciously aware that they are rejecting a claim based on this factor and they might very well be sincere in their skepticism. However, this is merely a form of wishful thinking. Other folks are well aware of what they are doing when they express their “skepticism.” Their goal is not to engage in a scientific debate over the matter-that is, engage in argumentation to achieve the truth. Rather, their objective is to persuade others to doubt climate change and thus protect their perceived interests. To be fair, there are folks who push climate change because doing so is in their own interest. As Al Gore will attest, there is considerable money to be made in this area. This, of course, does not show that Al Gore is wrong-“reasoning” this way would be to fall victim to a circumstantial ad homimem fallacy. Saying that the climate change deniers are wrong because they have an interest in denying it would also commit this fallacy (the sword of logic cuts both ways). Interesting, while whether climate change is occurring or not (and whether or not it is our doing) is a scientific matter, much of the fighting is done in the realm of politics and rhetoric. However, factual claims about climate are not settled by who has the best rhetoric or who can get the most votes. They must be settled by scientific means. As such, it is important to cut through the rhetoric (and fallacies) and get to the heart of the matter. While the consensus of the experts is that climate change is real and is caused, at least in part, by humans, I am not an expert on climate change. But, I am rational and, as such, I will accept their view unless adequate contrary evidence is provided from unbiased sources. One interesting phenomenon is that groups often adopt a set of stock views and arguments that are almost mechanically deployed to defend the views. In many cases, the pattern of responses seems almost robotic-in many “discussions” I can predict what stock arguments will be deployed next. I have even found that if I can lure someone off their pre-established talking points, then they are often quite at a loss as to what to say next. This, I suspect, is a sign that a person does not really have his/her own arguments but is merely putting forth established dogmarguments (dogmatic arguments). Apparently someone else noticed this phenomenon-specifically in the context of global warming arguments and decided to create his own argubot. Nigel Leck created a script that searches Twitter for key phrases associated with stock arguments against the view that humans have caused global warming. When the argubot finds a foe it then engages by sending a response tweet containing a counter to the argument (and relevant links). In some cases the target of the argubot does not realize that s/he is arguing with a script and not a person. The argubot is set up to respond with a variety of “prefabricated” arguments when the target repeats an argument, thus helping to create that impression. The argubot also has a repertoire that goes beyond global warming. For example, it is stocked with arguments about religion. This also allows it to maintain the impression that it is a person. While the argubot is reasonably sophisticated, it is not quite up to the Turing test. For example, it cannot discern when people are joking. While it can fool people into thinking they are arguing with a person, it is important to note that the debate takes place in the context of Twitter. As such, each tweet is limited to 140 characters. This makes it much easier for a argubot to pass itself off as a person. Also worth considering is the fact that people tend to have rather low expectations for the contents of tweets which makes it much easier for an argubot to masquerade as a person. However, it is probably just a matter of time before a bot passes the Tweeter Test (being able to properly pass itself off as person in the context of twitter). What I find most interesting about the argubot is not that it can often pass as a human tweeter, but that the argumentative process with its targets can be automated in this manner. This inclines me to think that the people who the argubot are arguing with are also, in effect, argubots. That is, they are also “running scripts” and presenting pre-fabricated arguments they have acquired from others. As such, it could be seen as a case of a computer based argubot arguing against biological argubots with both sides relying on scripts and data provided by others. It would be interesting to see the results if someone wrote another argubot to engage the current argubot in debate. Perhaps in the future argumentation will be left to the argubots and the silicon tower will replace the ivory tower. Then again, this would probably put me out of work. One final point worth considering is the ethics of the argubot at hand. One concern is that it seems deceptive: it creates the impression that the target is engaged in a conversation with a person when s/he is actually just engaged with a script. Of course, the argubot does not state that it is a person nor does it make use of deception to harm the target. Given its purpose, to argue about global warming, it seems to be irrelevant whether the arguing is done by a person or a script. This contrasts with cases in which it does matter, such as a chatbot designed to trick someone into thinking that another person is romantically interested in them or to otherwise engage with the intent to deceive. As such, the argubot does not seem to be unethical in regards to fact that people might think it is a person. 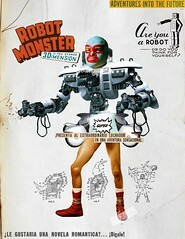 Another concern is that the argubot seeks out targets and engages them (an argumentative Terminator or Berserker). This, some might claim, could be seen as a form of spamming or harassment. As far as the spamming goes, the argubot does not deploy what would intuitively be considered spam in terms of its content. After all, it is not trying to sell a product, etc. However, it might be argued that it is sending out unsolicited bulk tweets, which might thus be regarded as spam. Spamming is rather well established as immoral (if an argument is wanted, read “Evil Spam” in my book What Don’t You Know? ) and if the argubot is spamming, then this would be unethical. While the argubot might seem like a spambot, one way to defend it against this charge is to note that the argubot provides what are mostly relevant responses that are comparable to what a human would legitimately send in response to a tweet. Thus, while it is automated, it is arguing rather than spamming. This seems to be an important distinction. After all, the argubot does not try to sell male enhancement, scam people, or get people to download a virus. Rather, it responds to arguments that can be seen as inviting a response-be it from a person or a script. In regards to the harassment charge, the argubot does not seem to be engaged in what could be legitimately considered harassment. First, the content does not seem to constitute harassment. Second, the context of the “debate” is a public forum (Twitter) that explicitly allows such interactions to take place-whether they involve just humans or humans and bots. Obviously, an argubot could be written that would actually be spamming or engaged in harassment. However, this argubot does not seem to cross the ethical line in regards to this behavior. I suspect that we will see more argubots soon. As the political theater plays out inside, folks are protesting outside the climate summit in Copenhagen. On one hand, it is a good thing that representatives are meeting to engage in the political game playing that makes up a summit. After all, climate change is a matter of serious concern and can have a very significant impact on human civilization. While I am skeptical of the efficacy of political talk, that is (ironically enough) the starting point for action (or inaction). On the other hand, it does seem like the elites are meeting to create more useless hot air: to posture and pontificate (and line up new political and financial deals). While there is a scientific consensus on global warming, the recent disclosure of the hacked emails has raised serious doubts. After all, if some scientists have allegedly engaged in duplicitous behavior then it would not be unreasonable to be concerned about how far this has spread. After all, climate matters are now intensely political and this means that bias is to be suspected-both on the part of those who contend for and those who content against the claim that global warming is real and worrisome. Green is now a big industry and has generated vast sums of money for folks like Al Gore. While this does not prove that Al and folks are biased or making false claims, the fact that people stand to make a lot of money from green does create a situation of possible bias. After all, the need to go green rests heavily on assumptions about global warming. If global warming were not occurring, then the motivation to go green (and hence the green to be made from going green) would be substantially reduced. That said, if global warming will be as harmful as some have claimed, then going green would be rather important to the well being of our species. The fact that some people (such as Al Gore) will profit greatly from this has no actually effect on the truth or falsity of these claims. Obviously, the scientific community has reached a consensus on the matter, thus lending credence to the claims about the dangers of global warming. But, as noted above, the leaked emails and the fact that green is now a major profit (and political) engine do raise concerns that are worth paying attention to. I am for saving resources and I am against pollution. As such, I was “green” even before it was in to be green. However, I do not think that green should serve as a trump card and that our actions regarding the climate should be carefully considered in a realistic manner. Of course, part of being realistic is being aware that the matter is highly political and economic-so much so that the truth no doubt has been long lost amidst the green.